Long-form content vs. Short-form content Which is better? Remember the long and short copy debate, when print was king? So, which side has won? 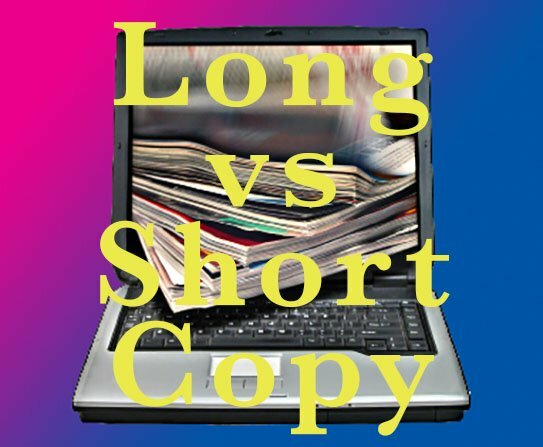 Long-form content (long copy) vs Short-form content, who wins over the reader/viewer? In today’s fast-paced, digital world, it’s so easy to say that definitely, short copy is the go. Really? An article published by John E Lincoln in Search Engine Land, puts the thesis that on the contrary, long copy is still favored. Hard to believe, right? BTW, he considers anything over 1,500 words to be long-form content. Another BTW, I prefer long copy only because it has its beginnings in the time of print. I’m sure, you’re probably twitching in front of your computer, tablet or mobile phone while reading this. After all, hey we’re in the age of Twitter, where posts are sent in short bites of 140 characters, right? As a marketing communications practitioner, who also offers SEO services, I’ve always believed that Google prefers to rank “authority” sites higher than other sites. And, looking into the SEO value of long-form content, Lincoln further notes that “Back in 2012, serpIQ conducted a study involving more than 20,000 keywords. The results showed that the average content length of each of the top 10 results was more than 2,000 words. The average number of words for the content in the #1 spot was 2,416. For the #10 spot, the average number of words was 2,032. Ok, I will continue more on this topic in my next blog. I know that means this post doesn’t make it to the long-form content category. Oh, well….